I'm loving this garden set that I purchased a year ago. The chairs are made of steel and the center table is made of marble. I never regret buying this one as I find it easy to manage and durable. The steel chairs can be repainted so there's no worry if the color has faded due to the changing weather. On the photo above, chairs were just repainted and this made the garden set looks brand new. 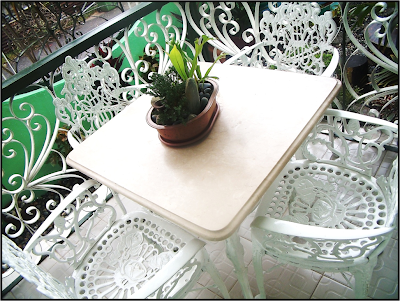 The marble table is easy to manage, this can just be wiped off with a wet cloth. It's texture and color never fades rain or shine. So I guess, this is a"good buy". The Price? P9,000 or $209. How about you? Do you love plants, too? Oh...di ka pala born with a green thumb Rovie. Me kasi namana ko hilig ko sa plants from my Mom. Ang galing nya magtanim at mag alaga. Itusok lang nya yung pinagputulan nung plant, nabubuhay na. Thanks for the compliments Rovie! How i wish i have a green thumb like mom and my husband. Ang ganda tlga ng merong garden sa bahay. @ AandW, Hi! Oo malaki talaga nagagawa sa bahay ng maraming plants around. Malamig sa mata at sa pakiramdam. 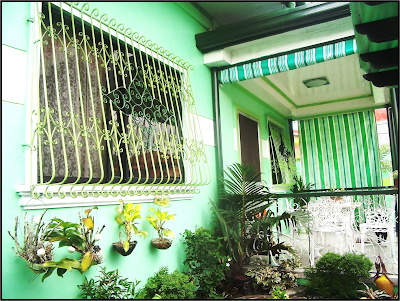 Even your house is just plain and simple, nagiging attractive sya pag madami plants. Hi KM! So good buy naman pala talaga sya. Kailangan sa Pinas durable eh because of the unpredictable weather.